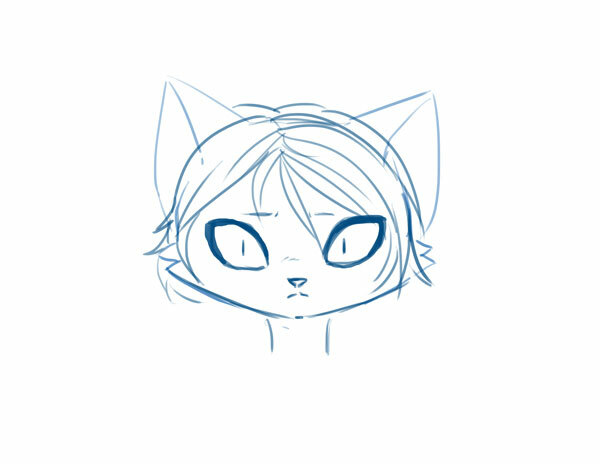 Hello, I'll try to write a little tutorial here, or a commentary about how to draw character faces using my style, this will be mostly focuse in the female head (I think it will be useful to point out the differences). It is important to consider that all of this information is focused in my own drawing style, which is influenced by a wide range of comic styles, in particular my Xeno creatures have bigger and sort of expressive eyes, more related to the cartoon and manga. 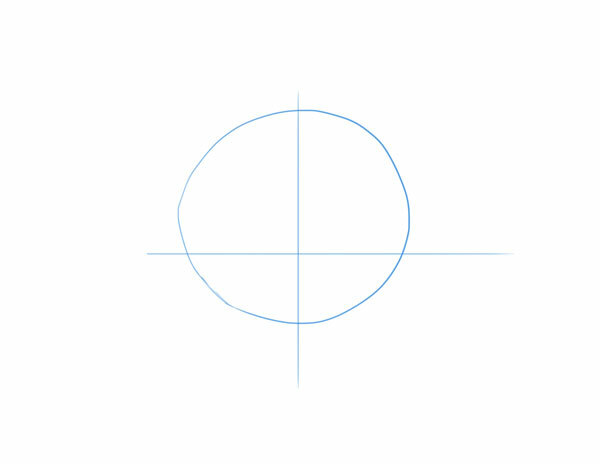 We start using the common circle and line guides for drawing faces. 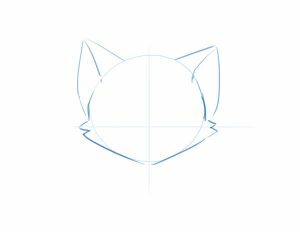 We will draw the fur of the cheeks, this is important because these lines are useful to set differences between one character and another, and it also helps define the general shape of the face. You can modify the direction and size of the fur to personalize further more the character! 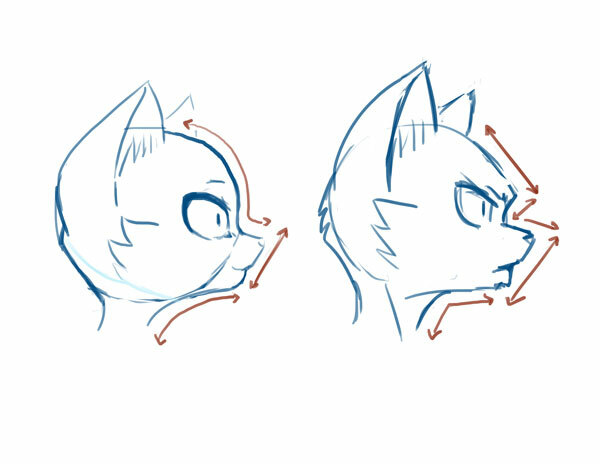 We draw the ears now, the shape of the ears, position of the ears is useful to give personalization to the characters. 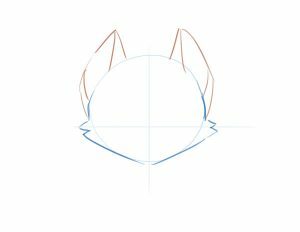 It's important to consider that the ears are located at the head, the point where the ear lobe would be is located right up where the fur cheek is. Now we can draw the eyes, nose and fix or refine little details. The character's face start to take shape. Something important here is that the distance between both eyes is generally "another eye" as measure reference. This means, if you want to be certain the eyes are well placed you can draw an imaginary eye between the two eyes and take that as a correct measure. 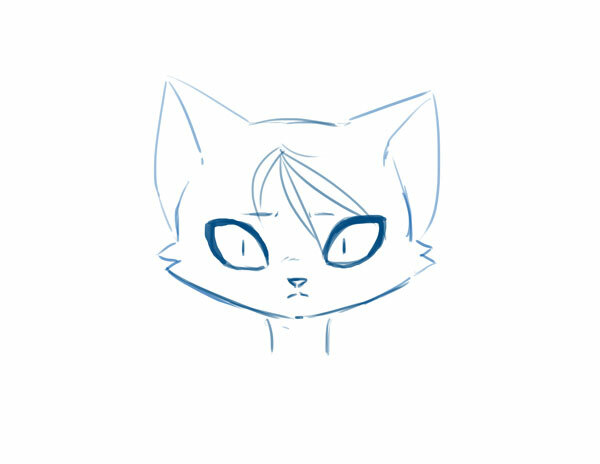 If you're drawing a female character is important to soften the chin and make the general shape of the face more rounded. The shape of the eyes is also very important to difference between male and female factions/faces. Male eyes are usually more angular and a bit smaller. The female eyes are more rounded and with very noticeable eyelashes. The female eyes are also more inclined and with a similar shape of an almond, they're also a bit bigger than male eyes. 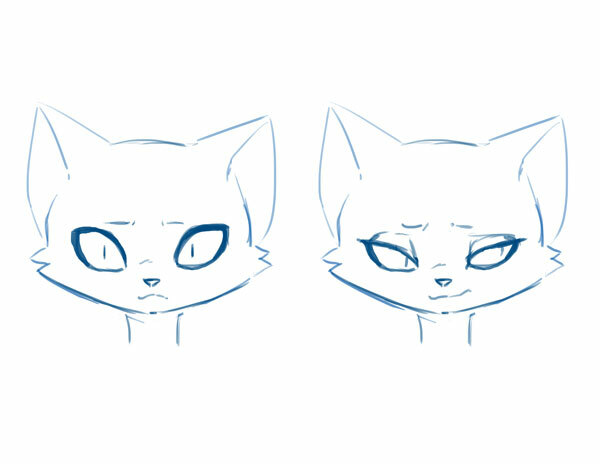 The eyes and eyebrows are the first way to show emotions in characters, it also helps them to make them different from each other by modifying the eye shape, size and the color of the iris. We draw the mouth now (or the muzzle in this case). Eyes, eyebrows and mouth are used to express emotion or even make some personality traits more noticeable. In the following image we will see an expression change of the same character by just modifying the previously mentioned features. 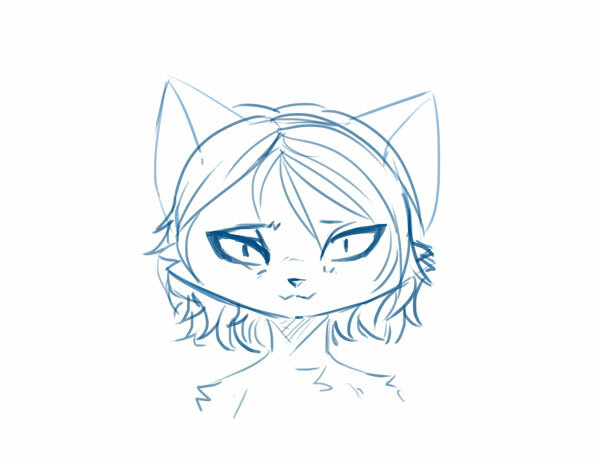 It's time to draw the hair, you can always give the character a personal hairstyle, I'll try to explain the way I usually draw the hair of my characters, lately I've been drawing defined hair locks that start in an specific part over the forehead. First, you should draw the hair over the forehead (the fringe? 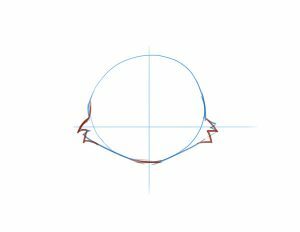 ), it's important to identify the point where these hair lines are generated, because from that point is where you'll generate the whole hairstyle. 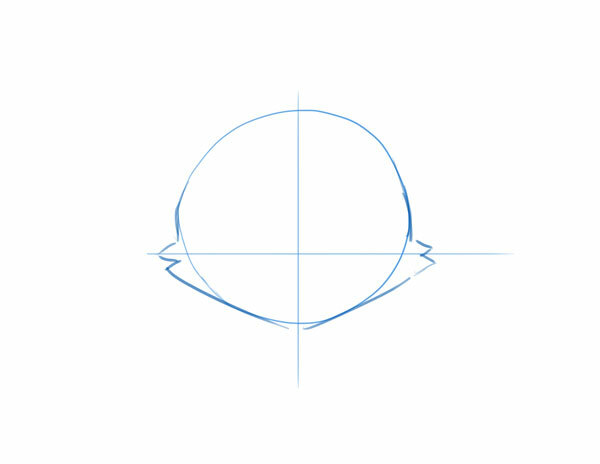 Second, you can draw the rest of the front hair, here's the important point where you'll define the hairstyle and volume of hair the character will have. 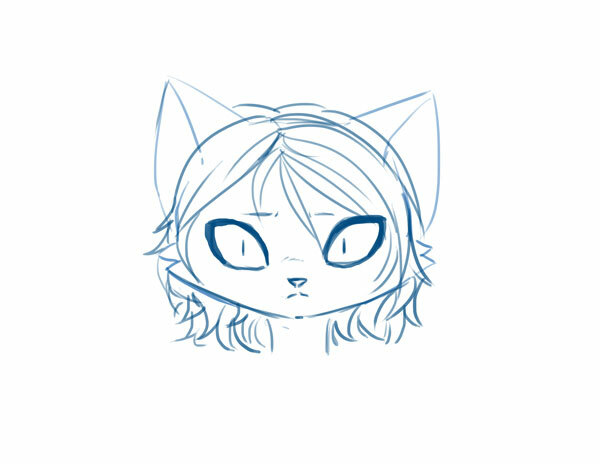 In this part I usually draw the front hair as some more hair locks well defined, the rest of the hair up front is usually a set of lines that define the shape and volume. And finally, you can draw the hair at the back and side of the head, you will usually end up drawing defined set of hair locks at the end of the hair or wavy end sections of hair if that's the case. I usually start drawing the hair locks just beside and behind the neck. 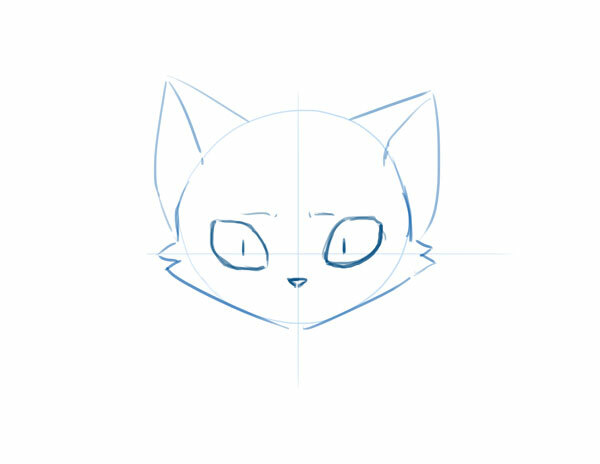 This is the most basic and important to consider I think, with a little modifications and extra line you can draw very quickly the face of Ivory. Here I will just point out some important things you need to consider to build a female and male face profile. 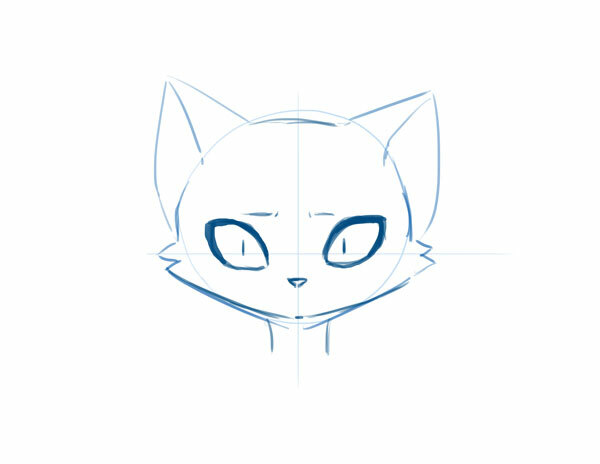 The female face is smaller, every faction is soft, it's important to consider the female forehead is more rounded, with no prominent section where the eyebrows are located, this is one of the most important things to consider when drawing a female character head. 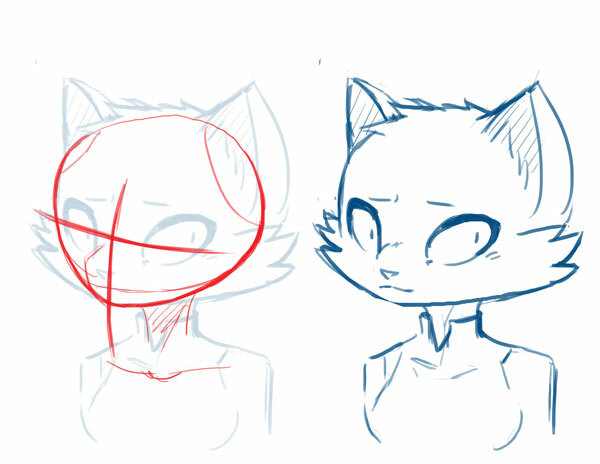 I leave this here as example, Kitty from Project Prime, just to show you the use of the same building guides draw with other perspective, you can use the same lines to build faces in every direction. The female face is more rounded and delicate than the male face, the mouth and nose is smaller, the shape of the chin is more rounded and smaller to make further contrast with the male face. Here is a small list with the key differences of the female face. Soften and rounded face factions. 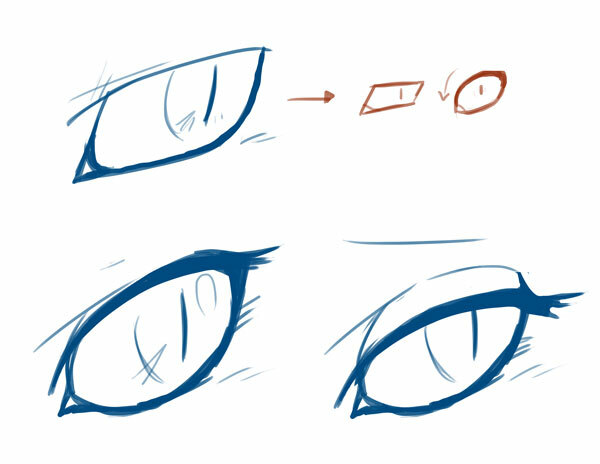 More inclined eyes, with a shape similar to a almond for female characters. The forehead is rounded, never flat or angular.